Are your ready to showcase a new app to your clients? Try out this cool TV monitor mockup to display your app's best features on a realistic screen. 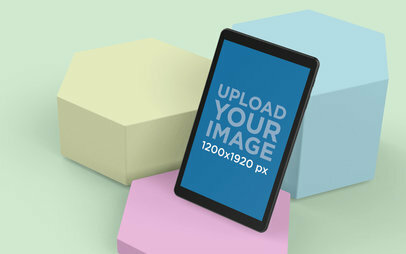 You can create all the digital mockups you need with Placeit's mockup generator complete with hundreds of customizable digital mockup templates, you just have to drag and drop your image over the placeholder and a download will be generated shortly! 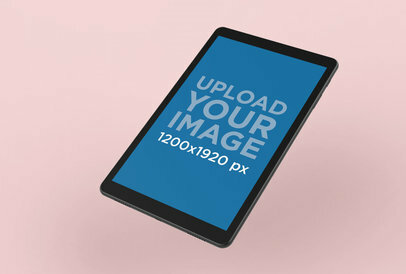 Use multiple device mockups to display your app's reach, this digital mockup features a Samsung Tablet, a monitor, Microsoft Surface and an Android in portrait and landscape position over a transparent background. Try it out now to see how your app can look like in different devices, all you need to do is drag and drop you images over the placeholders and our mockup generator will take care of the rest.Get tips for creating powerful content for your blog right here! 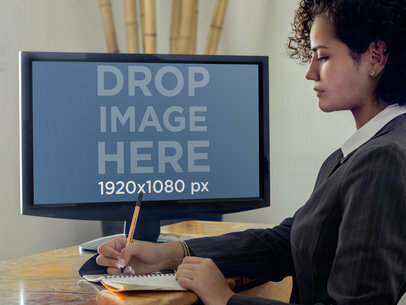 Use this beautiful mock-up template of a woman in a relaxed work environment with her ViewSonic Computer Monitor at the ready to showcase your web or desktop app. The work environment shown here is casual but productive, and will be even more productive once they have your web or desktop app as an aid. 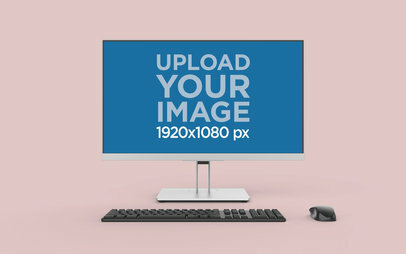 Show the beauty of your web or desktop app as a contrast to the muted color scheme of this mock-up template by dragging and dropping a screenshot of your image onto the monitor screen. If you don't have a screenshot at the ready, upload a screenshot from a URL by selecting "Grab Screenshot From URL" above the mock-up template and typing the URL when prompted; Placeit will automatically adjust your image to the needed dimensions and your web or desktop app will be brought to life. See more Windows mockups here! 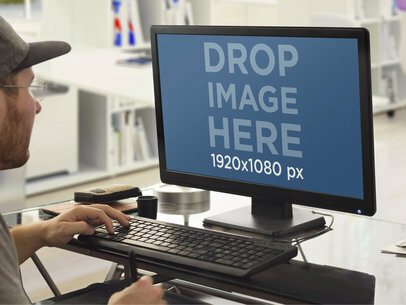 Showoff your stylish new website or web app is with this stellar Placeit desktop PC stock photo template featuring a young man at work on his landscape oriented Samsung PC. Add to your arsenal of persuasive marketing tools when you trust Placeit to make a lasting impression on your target market. This energetic scene is a bold frame to introduce your new website to the marketplace. 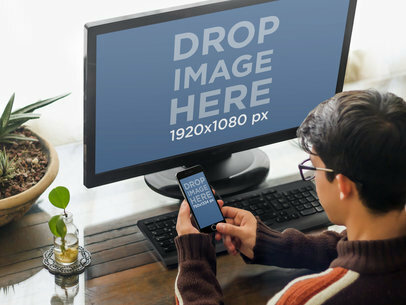 If you’re ready to bring your new website to life, simply drag and drop your desired screenshot onto the monitor’s screen in the template or import a screenshot from a URL by clicking the "Grab Screenshot From URL" button above the template and type in the URL so Placeit can do it for you. It’s always fast and easy to use Placeit website marketing software so get started today and take your marketing strategy to the next level of sophistication. 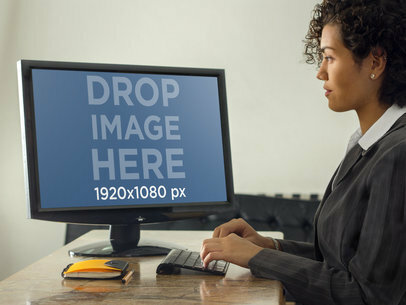 This chic Placeit mockup generator features a young professional woman sitting at her desk, hard at work on a black and silver HP flat screen PC at an angled landscape position. Her office is cool, bright and minimalistic. Her work space features a hip retro rotary telephone and tabletop fan in the background. She could be a design student or accomplished architect using your new website to aid in her successful career. Or maybe she’s booking her next getaway. Whatever it is, her day is a breeze with the help of your product. Frame your website in this image of youth and success. 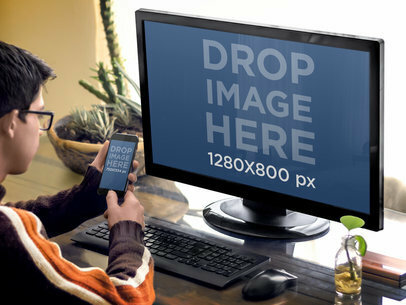 See this scene at its best with your website placed on the HP flat screen. Simply drag and drop a screenshot of your website directly onto the screen or type a URL above and Placeit will automatically adjust it for a gorgeous custom mockup. 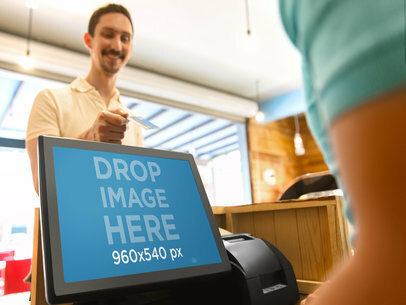 Modernize your marketing plan and reach your customers today with this hip Placeit HP mockup template. This Placeit PC & Tablet template is the perfect scene to appeal to all the young gamers out there that need to know about your new website or app. When you’ve grown up in the digital age, life is all about multitasking on multiple cool devices and this template is all about the fun factor. Here we have a young male situated in a gamers’ dream room featuring a PC as well as a tablet he holds in landscape position. He wears cool new headphones and is enjoying life and your new app or website. He could be playing on the PC flat screen while sharing your product with friends and family on the tablet. 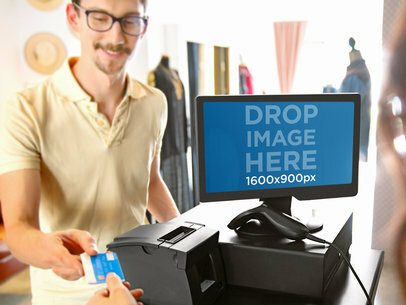 There are so many ways to capture your customers’ attention with this Placeit PC & Tablet template. Get started making a marketing impact and your custom mockup today. Just drag and drop a screenshot of your app or website directly onto the screens or click "Grab Screenshot From URL" above the photo and type in the URL as prompted and Placeit will do the rest. 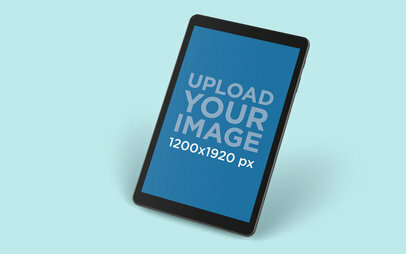 Watch your product come to life in this fun Placeit PC & Tablet template. Check our new blog post on Twitch Streaming Tips and Tricks! 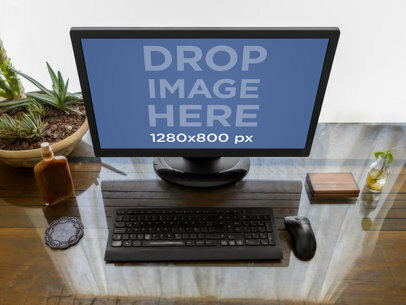 This image features a black desktop computer sitting on top of a wooden desk, next to a cup of coffee and a notepad at a home office. Use this compelling image to advertise your newly created website or web app and make a long-lasting impression on your clients! Don't you think stock photos like this are a great visual asset? If you do, then it might be time to start considering upgrading your marketing strategy and making marketing tools from Placeit a part of it today! This mockup comes with a lot of possibilities. 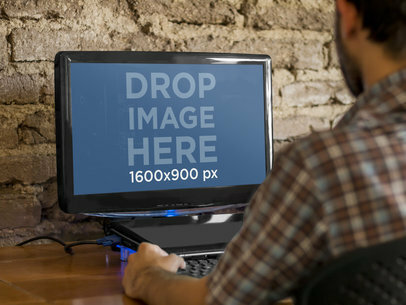 This scenario features a young man sitting in front of a PC. The atmosphere is a little more casual than a typical business setting. So he could be at home relaxing after a long, working at the library on a school project or this scene could still take place in a creative office environment. Which means this scene could work as a marketing tool for either a business related website, an educational site or a more leisurely site. There aren’t any restrictions with a mockup like this one. You use this mockup to promote anything, because just about everyone can relate to this scene, if marketed the right way. This is a great scenario in which you can display a screenshot of your new website or web app, and in two different screens! 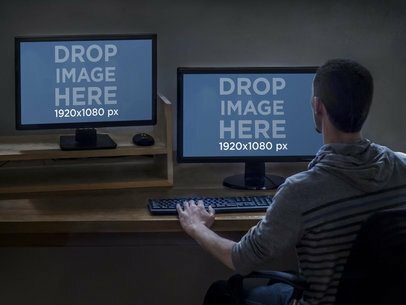 This mockup template features a young man who is working late at night at the office, he is multitasking as he is using both PC Desktops at the same time; he is probably working on something creative like editing a video, or perhaps coding a new software, the possibilities are endless. 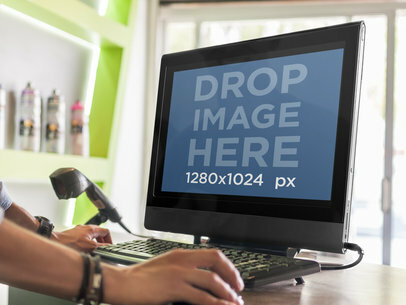 Go ahead and try this fantastic stock photo template right away as a part of your app marketing campaign, all you have to do is drag and drop a screenshot directly into the computers' screen. Or simply type a URL above and Placeit will adjust it for you. Now this android and PC mockup has a lot of potential. This scene features a business man working hard in front of a desktop. He is really focused and is using both his computer and his Moto E smartphone to multitask. 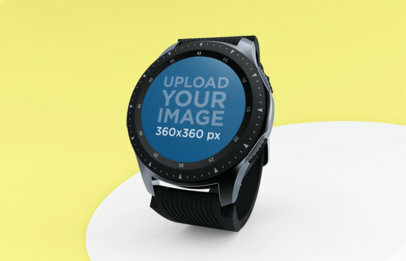 The large screen of the computer means you can upload a detailed screenshot from your own website and turn this simple mockup, into a fantastic marketing tool. As an added bonus, this mockup also features a great shot of the man’s Moto E Smartphone. Which means you can upload a photo from you mobile responsive site. Allowing you to sell both sides of your website. 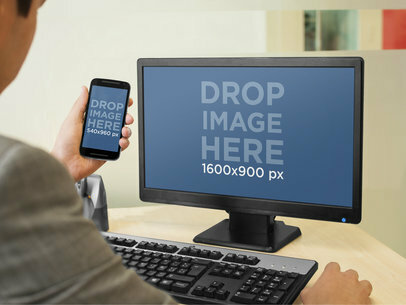 This beautiful Placeit marketing template features both a black Samsung Flat screen PC as well as an HTC smartphone. 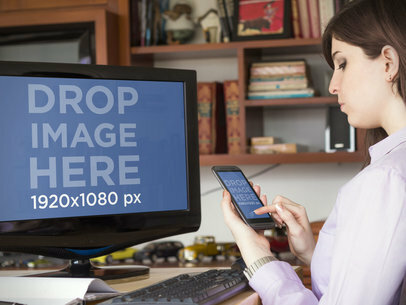 Here we have a young professional working woman in her home office, using your new website as she simultaneously scrolls through the HTC smartphone, perhaps texting or sharing about all it has to offer. She just can’t wait to tell everyone about it! Stylish wood bookcases fade into the background as your website dominates the Samsung PC flat screen. Don’t miss out on this Placeit template; it really has tremendous potential to make a huge marketing impact on your target market. 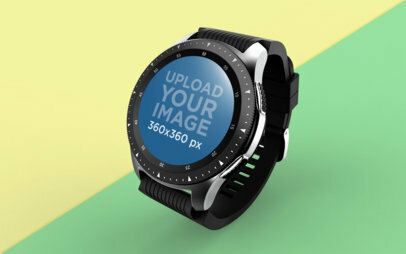 Make a custom mockup today. Simply drag and drop a screenshot of your app or website directly onto the screens or type a URL above and Placeit will automatically adjust it for you. Let’s get to work! You've got the tool to enable up and coming 3D animators. 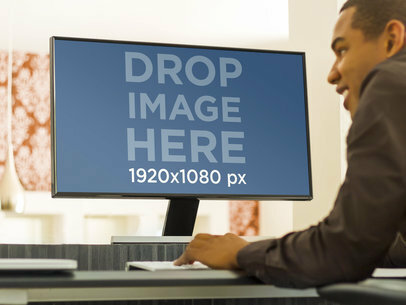 You know it, so help your clients envision it just as clearly on this landscape HP PC Monitor. Use this template to appeal to those who will be working either from home or from a casual workplace; the muted tones of the background and focus of the gentleman draw all attention to your web app or website, but this young man's attire conveys that although he takes his work seriously, he's constantly thinking of his end users and the joy your product will help to bring them. This is perfect for your product! What are you waiting for? To make your work his focal point, drag and drop a screenshot or upload a screenshot from a URL by clicking "Grab Screenshot From URL" above the image and typing in the URL as prompted. 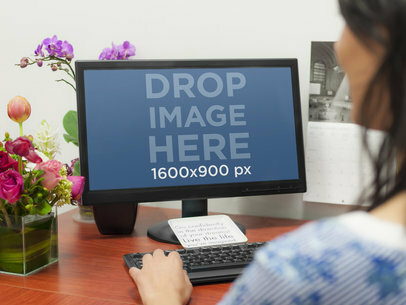 This PC mockup presents a fresh environment, we can see a woman working on her computer while at a creative office. You can pick this beautiful shot to display your new website or webapp within context. Don't imagine how your website would look on this lovely scenario, just drag a screenshot directly into the screen and see for yourself! Or you can just type your URL above and we will automatically generate a screenshot of the site for you. Mockups are a great way to enhance your web marketing strategy, especially because they help you share an insight on your actual product and its use cases. Try it out right away! See more Windows mockups here! Here a woman sits at her office taking a look at here iPhone 6. The iPhone 6 mockup is tilted toward the left in her hands. On the desk stands a PC mockup. The desk is wooden and is decorated in cheerful Christmas ornaments. In the background christmas lights twinkle lightly. The iPhone 6 mockup holds an image of 750x1334px. 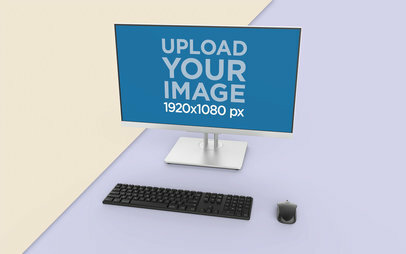 The desktop mockup holds an image of 1920x1080px. This is perfect for displaying a responsive website. Do you have a new business or professional website? Then you need to add Placeit's mockup templates and to your online marketing strategy. Why should you choose Placeit? Because Placeit is an unbelievably great marketing tool. Take this scene, it features a young business woman, working hard at her desk. You can tell that whatever is on her desktop PC's screen is making her job easier. The modern office background in this mockup helps provide a fresh and professional feel to this scene. Plus, the great lighting really illuminates the large screen of the ViewSonic Desktop mockup. All of these elements combined to create an amazingly effective marketing tool for you. And there are two easy ways for you to create your online marketing tool. 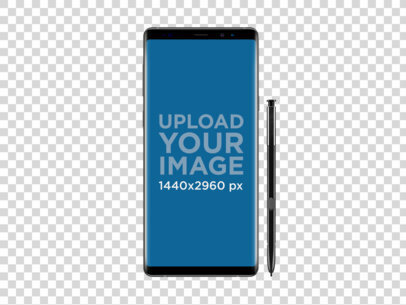 The first option: you drag a screenshot from your website and place it onto the ViewSonic Desktop's screen and then download the template, or you can type your URL above and Placeit with send you this mockup, featuring a shot from your website. 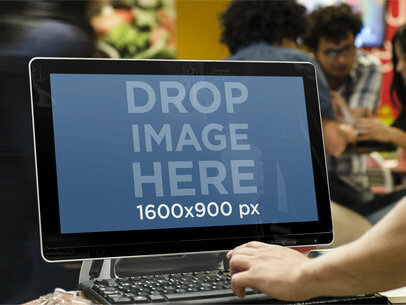 It truly is that easy to turn a Placeit pc mockup template into a great marketing tool. See more Windows mockups here! Are you in need of a creative way to market your business or professional helpful website? Then what you need is to incorporate Placeit's mockup templates and video templates, into your online marketing strategy. What makes Placeit's so great? Because Placeit is an incredible and entertaining marketing tool. Look at this professional scene, for example; it features a young professional business woman, working hard at her desk. She's smiling at her screen, so you can tell that whatever is on her screen is making her job so much easier. The modern office background in this mockup helps provide a fresh, young, yet professional feel to this scene. Plus, the great lighting really illuminates the large screen of the ViewSonic Desktop. All of these elements combined to create an effective marketing tool for your use. 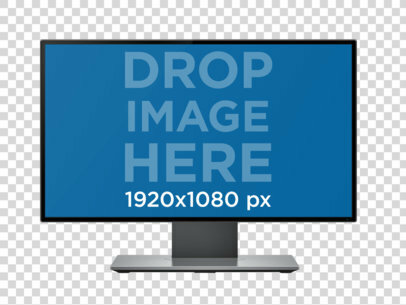 All you need to do is to drag a screenshot from your website and place it onto the ViewSonic Desktop's screen and then download the template. It truly is that easy to turn a Placeit template into a great marketing tool, to promote your online business. See more Windows mockups here! This unique Placeit template is truly eye catching and the perfect marketing tool for your new website. 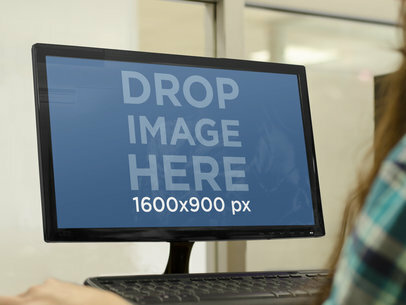 Featuring an HP flat screen, we have a young lady sitting and working on this PC in a natural angled landscape position. The theme of this mockup template is anything related to travel, as the background wall is a clever display of a colorful world map and reminiscent treasures found abroad. Is she planning an Alaskan adventure, or a tropical escape? Where ever her wanderlust takes her, she clearly can’t accomplish all the arrangements without your website. Place your website on the HP screen and appeal to your target market today with this specially designed HP Placeit marketing template. Using the Placeit mockup generator is so easy. Just drag and drop a screenshot of your website directly onto the screen in the template or click on the "Grab Screenshot From URL" button above and type in the URL so Placeit can do it for you. 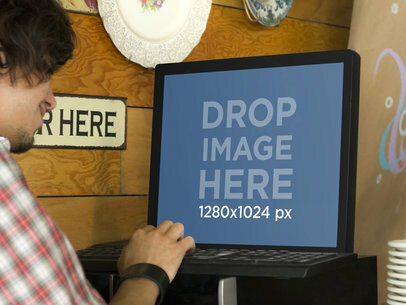 Get custom marketing mockups featuring your website with this Placeit HP template now. 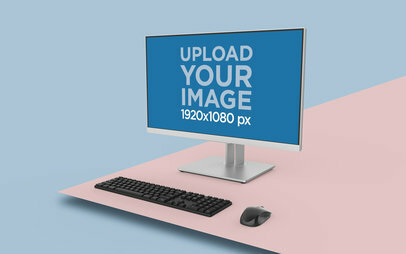 This desktop mockup featuring a student at a computer lab is the perfect scenario in which you can display and promote your latest website or web app to create an impact on your audience. 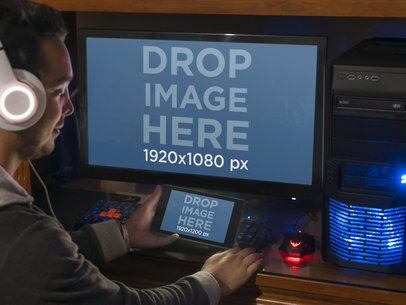 All you need to do is drag and drop a screenshot and it will be automatically added to the desktop mockup. 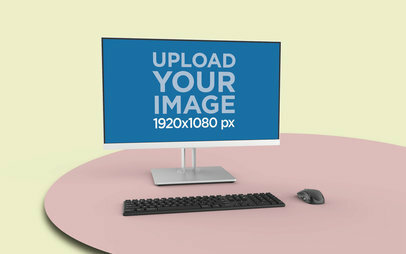 To see another Desktop Mockup click here! 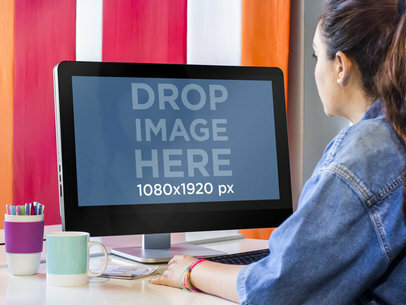 This stock photo template features a young female student using a PC at a computer classroom at school. Is she finishing homework? Doing research for a project? Or is she simply emailing a friend? The possibilities are endless! 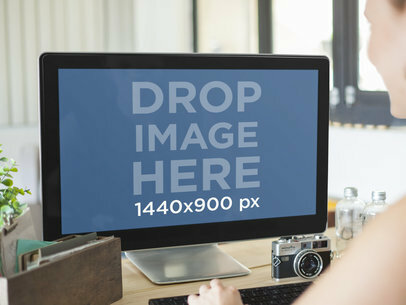 Use this mockup to advertise your website and reach your specific target market at a glance. 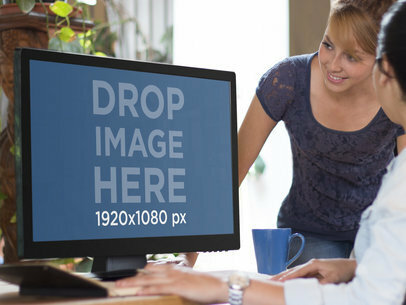 Your website will look great being displayed on this PC screen. 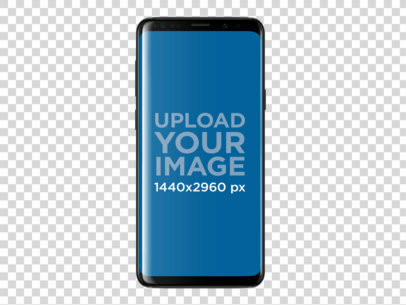 To use stock photos all you have to do is drag and drop an image onto the device on the template and Placeit will resize it so you can start enjoying great visual content right away. 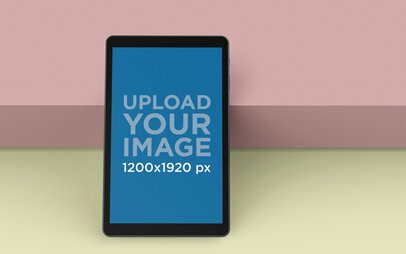 PSD mockups here! This PC Mockup template is a great scenario in which you can showcase your new website or app in a clever and professional manner. 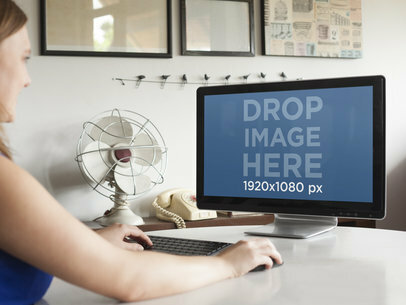 This Desktop PC mockup features a young lady doing some research on the computer, she is probably a college student or young teacher. Just drop your screenshot on the image, or type your URL above and Placeit will deliver a compelling image for you to use for app marketing. 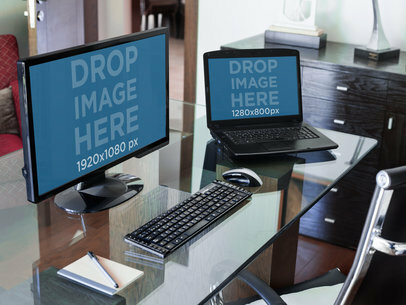 A desktop PC mockup sitting on a shiny, wooden desk. The PC has a black monitor, black keyboard and black mouse. The desk it lays on is brown and very shiny, reflecting the wonderful window that lets in dreamy light. To the left, some plants frame this gorgeous stage, that can be used for any casual use app. You can also use it for websites aimed at creative types. Just drop in any URL or an image in 1280x800px aspect ratio or similar. See more Windows mockups here! 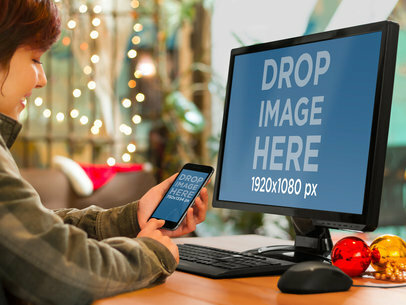 We know you’ve worked to develop your new web app and it’s time to introduce it to the marketplace so let Placeit marketing tools do the rest of the work for you with this authentic and charming stock photo mockup. 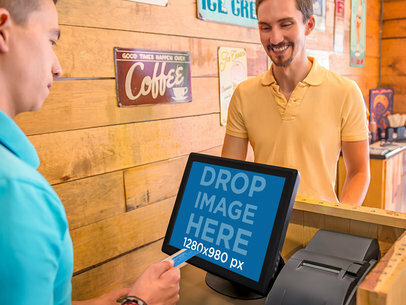 The setting is a casual and eclectic eatery offering ice cream and coffee and featuring a cashier completing a transaction for a happy male customer. 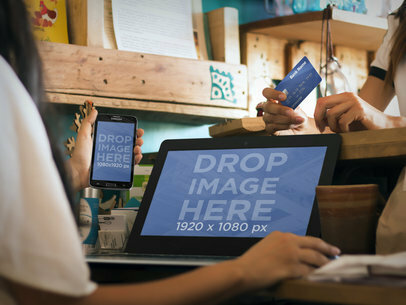 Whether he’s ordered and purchased coffee for just himself or the whole office staff, the easiness of this transaction with the help of your new point of sale web app is unmistakable. The only thing missing in this scene is you so create a custom mockup now to see it with your app on the monitor. Its fast and easy to do. Just upload a screenshot of your website or web app onto the monitor or input the URL so Placeit can do it for you. You won't be sorry you chose this one. See more Windows mockups here! Are you looking for a creative way to market your business website? 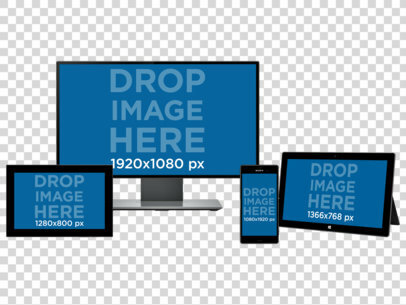 Then you need to implement Placeit's mockup templates and video templates, into your online marketing strategy. Why should you jump onto the Placeit bandwagon? Because Placeit is an amazing and fun marketing tool. Look at this clever scene, for example; it features a professional business woman, working hard at her desk. She's smiling at her screen, so you can tell that whatever is on her screen is making her job so much easier. The modern office background in this mockup helps provide a fresh, young, yet professional feel to this scene. Plus, the large open windows in the background help light up the whole template. The natural lighting really illuminates the large screen of the Sony Vaio Desktop. All of these elements combined to create an effective marketing tool for your use. All you need to do is to drag a screenshot from your website and place it onto the Sony Vaio Desktop's screen and then download the template. 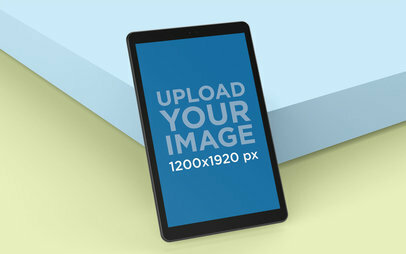 It truly is that easy to turn a Placeit mockup template into a great marketing tool. 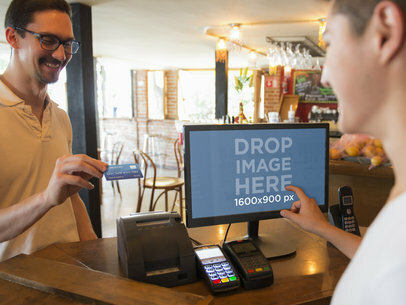 This dynamic scene from Placeit marketing tools beautifully shows off your new point of sale web app. 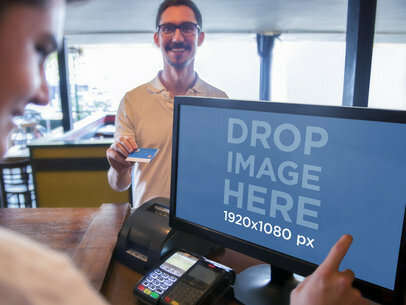 It features a man holding a bank card out to a cashier to complete a purchase using your new web app on a back PC monitor. The backdrop is a bright and casual restaurant with indoor and outdoor seating. Whether he’s a regular customer dinning in or picking up takeout, the ease of this sale transaction because of your new web app is evident in his authentic smile. This scene leaves a powerful impression on your target market so don’t hesitate to try it out. Just upload a screenshot of your website or web app onto the monitor or input the URL so Placeit can do it for you. It’s always fast and convenient to use Placeit app marketing software so get started now and get on your way to taking your marketing strategy to a professional level. This is the perfect Placeit marketing template to display your new web app, website or restaurant software. 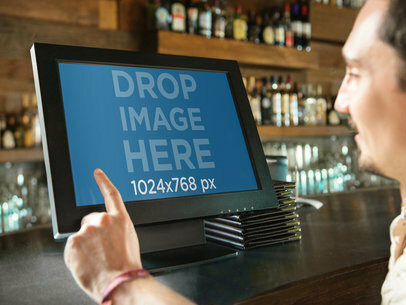 Featuring a young male waiter using a black LG Flatron T1710 in a hip restaurant, it is truly the best scene to showcase what your product has to offer the restaurant and food service industry. This Placeit LG Flatron T1710 mock-up template has an awesome vibe and will absolutely capture the attention of your target market. The only thing missing is your software or website featured on the LG Flatron. 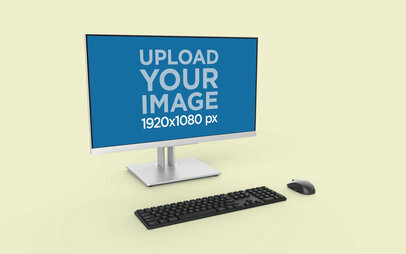 Get Placeit marketing tools working for you and make a custom mockup today. The Placeit mockup generator is fast and easy to use, just like your software. Simply drag and drop a screenshot of your program or website directly onto the screen in the template or click on the "Grab Screenshot From URL" button above the photo and type in the URL so Placeit marketing experts can do it for you. There is no better time to make a presence in the restaurant and food service industry with this awesome LG Flatron T1710 Placeit template than now. See more Windows mockups here!